Hey there friends! I hope you all had a great Christmas and are getting ready to celebrate the upcoming New Year!! 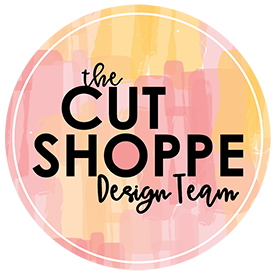 I have a new layout to share with you today that was recently on The Cut Shoppe Blog using the Snow Day Background Cut File. I started in Cricut Design Space by slicing out one of the snowflakes from this background cut file. I then duplicated and resized the image numerous times and cut the snowflakes on white cardstock and vellum. After I had the snowflakes cut I moved onto my background. I found this blue snowflake patterned paper in my stash. Multiple times a year (and especially when we enter a new season…Halloween, Christmas, etc), I purge and destash. I actually really enjoy this process because I always come across products I forgot that I have…including this patterned paper that I purchased from Michaels years ago. I used White Gesso in a couple spots on the patterned paper and grabbed a few spray inks (2 pinks & 1 blue) from Shimmerz. I sprayed the ink directly onto the background, used the packaging technique, and added splatters to the background using all 3 colors. I adhered the snowflakes in the same area that I had applied the mixed media. I added a dot of Liquid Adhesive to the center of each snowflake. This allowed the edges of the snowflakes to curl naturally giving the layout a lot of interest and dimension. I then used a few die cuts from the Crate Paper Snow and Cocoa Ephemera Pack and Sticker Sheet. I also added a few die cuts from an older Hip Kit Club kit. I then used my Sewing Machine and silver metallic thread to stitch around the circle to secure all of the snowflakes and die cuts. Using a Canon Selphy, I printed my photo as a 3½ x 3½ inch square and used a Stitched Circle Die to cut the photo into a circular shape. I nestled the photo into the snowflakes and added a few more embellishments from the Crate Paper Snow and Cocoa Ephemera Pack and Sticker Sheet. I added my multi-colored title using the CP Snow and Cocoa Puffy Stickers. I absolutely LOVE the colors included in the Snow and Cocoa Collection & was SO happy to see the Crate Paper released this collection for a second year in a row! For final touches, I added a few more splatters using the same Shimmerz sprays and I also watered down white acrylic paint. I added my date using a Heidi Swapp roller date stamp and black ink. I absolutely love how this layout came together. Remember to head to The Cut Shoppe Etsy Store to check out all of the cut files and as an added bonus there is a great sale happening! Make sure you take advantage!! Thanks so much for spending part of your day with me! This blog post contains affiliate links. This means that I may receive a commission (at no cost to you) from items purchased from these links. Thanks so much, Becca!! I’m really happy with how this one turned out too! Those colors just speak to my heart! !